Love theater performances and the opera? Join us for our annual Chinese Opera Benefit! Self-Help for the Elderly hosts the Chinese Opera Benefit once a year as a weekend event. It is a grand experience of Cantonese opera for everyone to enjoy. Cantonese opera is a traditional Chinese opera incorporating music, singing, acrobatics, martial arts, and acting. The traditional plots are based on Chinese historical stories and famous classics and myths. 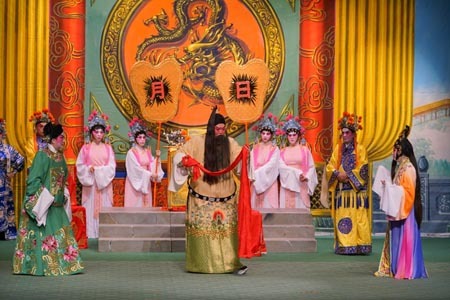 Each year, the Chinese Opera Benefit features the Duen Fung Ming Chinese Opera Troupe. The troupe features professional performers who put on a show full of the love and hate, gentle and bold, and war and peace complexity that Chinese opera has to offer. The night is filled with singing, dancing, pantomime, acrobatics, and clowning. It is a night filled of fun and friends! All ticket proceeds go towards Self-Help for the Elderly and the 40,000 seniors served annually. Contact Josephine Ma at josephinem@selfhelpelderly.org or 415-677-7668 today to reserve your tickets. Choose your seats here.